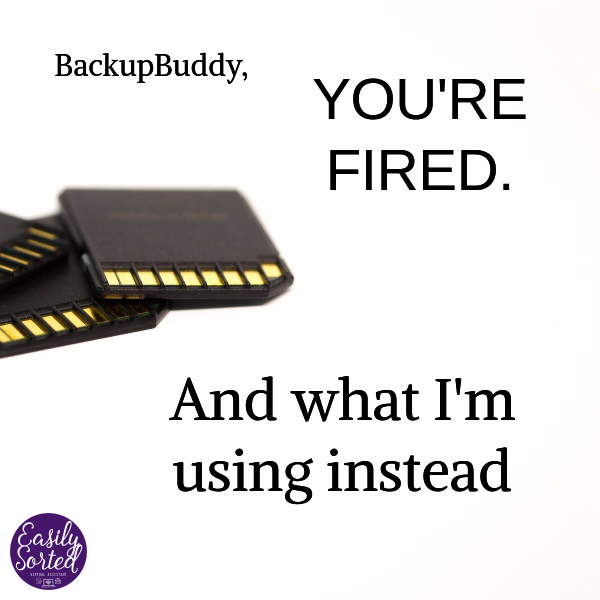 BackupBuddy, you’re fired. And what I’m using instead. We’ve been together for, what, almost a year now? And I think it’s time we have a talk about where this relationship is headed. Lately, I’m feeling like it’s just too much work. You’re a backup plugin. You’re supposed to back up my website – and my clients’ websites – without too much fuss. Right? Now, it’s true, it does take a little work to set up the schedules and the transfers to remote storage like Google Drive. But I figured setting it all up once was worth the benefits I’d get in the end. Well, see, here’s the thing. Every week – yes, EVERY week – for several weeks now, I’ve been getting emails from not one, but TWO websites saying you’re not doing the job I thought you were. And that’s bothering me. Because you know as well as I do that when I run a manual backup, everything works fine. Yeah, I wasn’t too happy about that. If you’d just told me what the problem was, I could have tried to help you. But all you told me was that the backup failed. You didn’t say why. That’s not much to go on. And the remote storage wasn’t even CLOSE to full when this happened, so that wasn’t the problem. So, I’m sorry I have to do this, but I’m going to have to let you go. I had great hopes for you, but I’m afraid you blew it. Yes, I’m really serious about this. No, I’m not giving you two weeks’ notice. You had your chance. Several, in fact. Besides, I’ve already found your replacement. I think you know it already – UpdraftPlus? Yeah, it was ready and eager to get started. I barely even had to tell it what to do. It just got to work. Yes, it works for free. Yes, I know it doesn’t have all the features that you do without paying for the premium version. But you know what? If the premium features are as good as the stuff that IS in the free version, I’d happily pay for it. You? Not anymore. So go on, pack up your stuff and get going. And I hope you use this as a learning experience. I wish you all the best for your future. Mel, the virtual assistant/WordPress admin who wants a plugin that just works, without all the hassle.